Sous les monstres, la fleur, 2015 (Roubaix, France). Installation for Galerie Le Fil Rouge. The building where Le Fil rouge and Le B.A.R are settled used to be the shop "Draperie Claude", selling textiles produced in Roubaix. At the beginning of 20th century, Roubaix was one of the most important cities in the world dedicated to producing textile. Nowadays, Roubaix is a leading place for innovative industries, including research on textiles. Within a dialogue with the original features of the basement, I have developed a fantasy echoing the folds of fabric. Warm thanks to Jean-François Boudailliez, Laurence Garfield, Milan Ramaji and Christine Rousseau for their collaboration. Body of sculptures related to coastal landscapes and rural architectural patterns. Open Thursday to Saturday and first Sunday of the month from 14:30 to 18:30.
until May the 3d, 2015. The Art Deco building of the town swimming pool was transformed into a museum in the 90's. I am grateful to Bruno Gaudichon and Sylvette Botella-Gaudichon, director and curator at La Piscine, for wellcoming this sculpture during my solo exhibition at Galerie Le Fil Rouge. 23 rue de l'Espérance, 59100 Roubaix, France. Compression/Explosion is a series of sculptures, which biggest one has been made at Terra, Kikinda, Serbia, in 2013-2014. In Périple, I have aimed at suggesting the diversity, beauty, strength and frailty of human beings. Millions of people have been moving all along the last century, and according to the United Nations Refugee Comity this tendency will increase in the 21st century, mainly because of the problems that global warming will cause, either directly (flooding and drought), or indirectly (conflicts caused by lack of water, submerged lands and disappearance of inhabited territories across the Earth). In the successive installations Migrants (WOCEF, Korea, 2009), Périple 1 (Kunstmuseum Bonrholm, Denmark, 2010) and Périple 2 (La Plus Petite Galerie du Monde (Ou presque)), Roubaix, France, 2013), each element is unique but bears resemblance with the others, as human beings do. Each of them shows cracks but stands. Black engravings by Mickaël Demeulemester. Circulations is a series of 20 ceramic sculptures that I made for a solow show at Frank Steyaert House, Gent, Belgium, in 2012. Air and light circulate through these sculptures. Wild! was a body of ten sculptures specially designed for the gardens of Maladrerie in Beauvais, and was part of the project "S'imbriquer". I worked for one month at Briquetterie De Wulf, using elements produced by the brick factory. The project "S'imbriquer" was funded by the Communauté de communes de Beauvais and organized by Clotilde Boitel, director of L'Ecole d'art du Beauvaisis. In 2010 I won the Bronze Brian Mercer residency and spent three months at Fonderia artistica Mariani in 2011, experimenting with wax and producing a series of maquettes and sculptures, of which 3 were cast in bronze. Pietrasanta has been enterily dedicated to artists working with bronze and marble for several centuries, after Michel Angelo set up his studio there. I make sculptures and installations that often suggest what it feels like to witness the kinetic beauty of the Earth's destruction. Human beings relate to their own planet in different ways, fluctuating between concern and neglect, pleasure and indifference. They live in an infinite universe, rarely think about it, mostly focus on spaces and times they can relate to, and as a result find it difficult to foresee that the Earth's resources are NOT infinite. Shedding landscapes reflect my interest in landscapes and cities. Each transport medium (by foot, bicycle, car, bus, train and plane) relates to a specific scale of time and allows discovering aspects of places that are not always visible while using another medium. I am interested in the ways landscapes and cities change. We live in an era where most inhabited places in the world change very fast, under the pressure of increasing population, increasing urban densification and global warming. Many places that are not inhabited today will soon become inhabited. If I reach the age of 85,, most of what I know today will have changed beyond recognition. Sometimes changes are splendid, even when dangerous for our condition as human beeings. It is this beauty that I try to convey in the shedding landscapes. Rien ne se perd, rien ne se crée is the name of a solo exhibition, which presented a body of 23 sculptures at Galerie XXI, Paris, in May 2011. The national museum of ceramics, "Sèvres-cité de la céramique", acquired Etude pour Ulysse n°1, 2011, which is now exhibited in the contemporary gallery of the permanent collection. Metamorphosis is a theme that constantly nourishes my work. 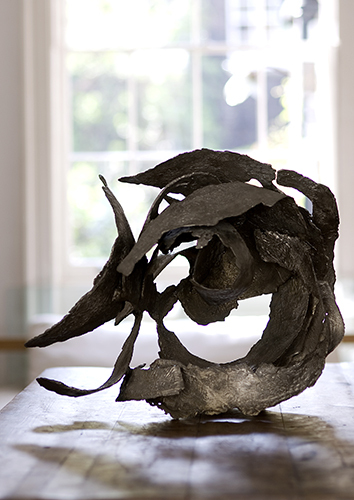 It is also the name of an exhibition presenting the work of four sculptors at the Royal British Society of Sculptors in 2011, in which I had a group of three sculptures suggesting different stages of a metamorphic process.